Crashes have many causes, a fact our San Francisco car crash lawyer knows from experience. In some cases, something that is otherwise gentle and innocent can lead to a terrible accident – a truth typified by deer crashes. An October 2012 report by the Insurance Journal notes that the problem has been compounded by urban sprawl and construction through deer habitats that lead to animals being displaced. 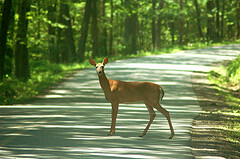 From July 1, 2011 to June 30, 2012, the United States saw an estimated 1.23 million deer-vehicle collisions. The crashes caused over $4 billion in vehicle damage. The Insurance Institute for Highway Safety notes that 200 people die in deer-related crashes every year. Notably, State Farm reports that, in the past four years, the number of deer-vehicle claims paid out grew by 7.9%, compared to an 8.6% decline in other moving vehicle claims. Deer-related accidents are the focus of a recent UC Davis study, discussed in the San Francisco Chronicle that found Caltrans could take steps to prevent deer and other animals from meandering onto Interstate 280 and being involved in motor vehicle accidents. Possible preventative measures include fencing and the construction of tunnels/overpasses providing safe passage across a dangerous part of I-280 (passages intended for people are not always animal-friendly). The recommendations follow a 30 month study analyzing roadkill, reviewing accident reports, and studying wildlife habitats on I-280 between San Bruno and Menlo Park. The study suggested that there was an increase in accidents in spots more accessible to wildlife. Noting that it is both an environmental threat and driver-safety issue, study author Fraser Shilling, criticized Caltrans inaction. According to the researcher, Caltrans considers animal crashes a low priority matter and has not developed a systematic approach to the problem. Not surprisingly, Caltrans disagrees with one spokesperson pointing to 2013 work on Highway 101 in San Luis Obispo that included wildlife underpasses, fencing, and electric maps designed to keep wildlife off the freeway. Another spokesperson said that the agency will review the report to see if any changes are appropriate. Approximately 1,000 deer are hit by cars in California each year. In 2013, nine deer died in vehicle accidents on I-280 between Millbrae and Foothill Expressway (luckily no people were hurt in those crashes). Shilling noted that when animal underpasses exist, some deer do use them, although it can take others a longer time to adapt and use the passages instead of going right over the freeway. He estimated that installing tunnels and fencing on I-280 could cost about $4 million. Could a government agency be held responsible if the failure to construct safety devices contributes to a deer-crash that causes human injury or death? What if the failure to remove a struck animal leads to a second accident? Such claims would have to overcome sovereign immunity, which protects government and government agencies from suit, and meet a number of procedural requirements. However, it is an avenue worth exploring, especially if a crash causes severe injury or death and carries huge economic costs. Other options for recovering damages exist (aside from suing the deer!). Insurance policies, particularly optional comprehensive automobile coverage, can cover animal-vehicle crashes, but insurance companies are notorious for contesting payment. Hiring a personal injury lawyer who has experience fighting insurance companies is essential to recovering compensation in such cases. In other circumstances, an injured person may have a claim against another driver if that driver’s negligence contributed to the animal-vehicle crash (i.e. one driver is inattentive or even drunk and hits a deer, causing a second car to collide with the first and leaving its occupants severely injured). As a San Francisco injury lawyer serving all of Northern California, Attorney Brod can help people injured in deer-vehicle crashes. Call to explore all your options.